The United Arab Emirates (UAE) is known to have a government that has a lot of goals for the betterment of the citizens, residents, tourists, and businesses in the country. It ensures that they have the best interests at the heart of those aforementioned people. Striving to be and staying as one of the most advanced countries in the world, the government of the UAE continues to find ways to completely change things here and there that would positively affect the country as a whole. From infrastructures to the tax system, the UAE always ensures that the economy of the country grows incessantly with every opportunity presented to them. In a meeting of the Cabinet that was chaired by His Highness Sheikh Mohammed bin Rashid Al Maktoum, Vice President and Prime Minister of the UAE and Ruler of Dubai, there are major changes that are considered to have positive effects on the country and its residents, visitors, and economy as well. There is a new legislative package that has been approved by the government, and the three new visa rules are all stated below for all people to peruse and enjoy. This is simply a mark on a person’s passport that is issued by a country’s government, signifying that the holder of that passport is allowed to enter, travel through, or live in the country where the visa is given. The stay of that individual is only for a specific amount of time with certain purposes, such as employment, tourism, education, or others. It has been approved by the cabinet to provide a residency visa for a year for nationals of countries that are suffering from wars and disasters. This can support them with regard to their living status while their countries are not yet suitable to be a place for dwelling by these people. It has been announced that regardless of the conditions of their stay, these people whose home countries are affected by wars and disasters are permitted to be given a year of stay. The application for this kind of visa starts from the 1st of August until the 31st of October of this year. As per the decision of the Cabinet, the transit passengers are now allowed to stay for 48 hours without any fees and can even extend it up to 96 hours for only AED 50. Express counters in the airports of the UAE will be available for procuring this a transit visa. The last, but as important as the other two above, is the decision of the Cabinet to permit overstayed job seekers to leave the country without giving them a “no entry” stamp on their passports. For those overstayed job seekers who want to stay and work in the country, they are given the opportunity to obtain a six-month visa. The government believes that this will put the UAE in the position of being a country full of opportunities with the variety of talents. For people that have entered the country in an illegal manner, they are given the chance to leave the country voluntarily with a “no entry” stamp for only two years. This is provided that they are going to present a valid return ticket. 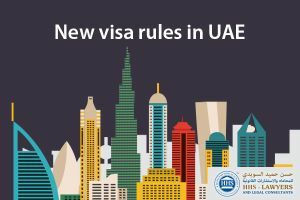 There is also a way not to adjust a visa status of an individual without having to leave and re-enter the UAE. This only costs for a certain amount. This decision is for the goal of the government of the country to simplify the process and procedures of visa processing, and also, to ease individuals with the financial burden that they carry with visa changes. There are a lot of changes that can happen in the UAE laws and regulations. It is always better to stay on the loop as to not be ignorant of them, as ignorance of the law excuses no one. Hence, HHS Lawyers and Legal Consultants, one of the top lawyers in Dubai, can act as a medium for you to be more informed with any changes with regard to the laws that surround visas and any other that concerns your business. It is always advisable that you approach advocates in Dubai, regardless if you are situated in the same Emirate or another. We can help you out wherever you are. Our line is always open for you whenever you are in need of any legal advice. You can book a free consultation now with one of the best lawyers in Dubai that we have on our team.